Mook Ji Bar - Peekashu. Hello guys ! Here I am again, after dinner time, to bring you mouth watering delicious food pictures again ! I hope I succeed in tempting all of you to eat, and when you all grow fat, I won't seem so fat anymore hahahaha. Then the world will be a better place. Went there a long while ago to catch up with Yee Lyn ! She really knows a lot of hidden good places to eat and I wonder why she's still so skinny. I loved this. It has just the right balance of everything. 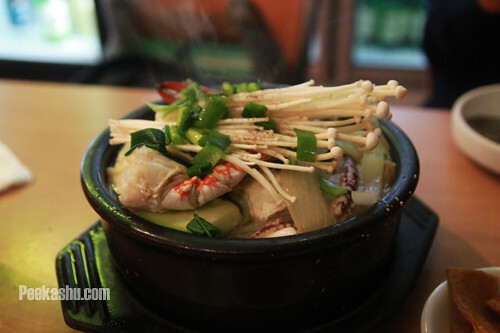 Filled with ingredients like crabs, mushrooms, prawns, clams and amazing tofu, the flavors simply burst in your mouth. I always hated tofu but this is really mouthgasm. You simply MUST MUST MUST order this. I reckon this is one of the best I've eaten. 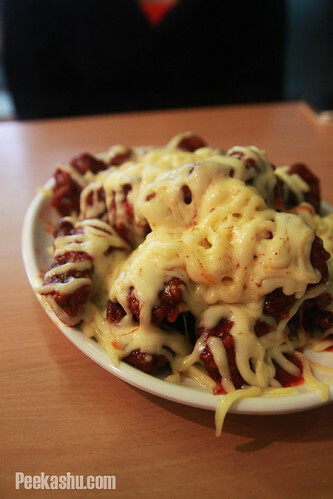 I like it even more that the one at CJ lunch bar mainly because I like chicken with bones in the middle compared to just a huge chunk of meat with cheese. Price : There were only two of us, we only ordered these two dishes and we really couldn't finish either of it. We had to get a takeaway box in the end. The portion is really worth the price. Approx $15-20 a person. Service : The service was a huge disappointment and I think most reviews on urbanspoon agree with me. I really would like to high five with the person who said they look like lost chickens. It took a really long time for them to get our order and serve us drinks. Nothing annoys me more than having to constantly remind the waiters to serve us plain water. Food : One of the best. 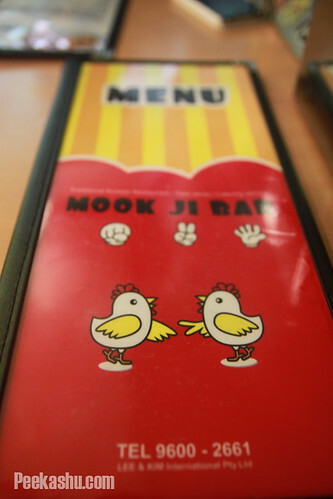 Cannot go wrong with authentic Korean food since Koreans themselves like to dine there! Everywhere around us were Koreans at that time ! Pretty popular among the Korean community. Environment : All I would say is that the place is small and cramped. I seem to always give really high ratings for restaurants but this restaurant really deserves it. Although I hated the service but the food really does pay off. Check it out ! !